Just Romantic Suspense: How Forgiving Are You? Congratulations to "Jane", the winner in Nina's giveaway. Thank you to all who participated! It seems authors are looking for that breakout story. The “different” that will make them stand out among all the books shouting for readers’ attention these days. Like everything, the boundary of what is acceptable and what isn’t is being challenged. Werewolves, vampires, angels, demons and even zombies are competing in the paranormal world, sometimes to the detriment of the human species. Serial killers and stalkers are being chased in crime novels with the gore and horror factors bordering on blood baths. And in the world of romance, it seems every combination of human relationship is available and love is not always found in the bedroom. But I wonder … how much will readers accept before they throw the book against the wall? Is a flesh-eating heroine acceptable? How about a serial killer looking to change his path? A cheating partner who wants to be forgiven? Are these characters “redeemable” and how far would you read before you decide you can’t take it anymore? I ask, because my newest romantic suspense novel, IN HIS EYES, has a hero, who at first glance, is a cheating husband. As a matter of fact, through most of the story, the reader is left to wonder what his true intentions are toward his soon-to-be ex-wife. I fussed and fretted over this premise, not really sure if readers would accept that the hero is truly head-over-heels in love with the heroine. Would they actually make it to the end and discover all the truths? So what do you think? At what point is a character not worth your time? How much leeway are you willing to give a hero/ine before you decide not to finish a book? Are there things that are absolute “will not finish” for you? 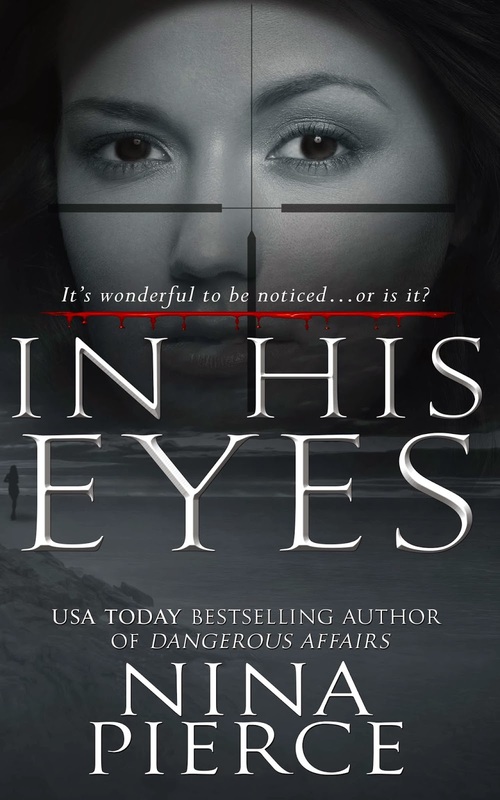 One commenter will be chosen at random to win a $10 Amazon gift card to buy your own copy of IN HIS EYES or simply feed your romantic suspense book buying habit. Maggie stood awkwardly at the back door, grateful her children were tucked far away from them. Muffled TV dialogue floated down the hall and spilled into the dimly lit kitchen. Disbelief washed over her, then humiliation, but it was anger that finally settled around her like a warm fog. Her husband stood with his palm open, her wedding band set—including the ruby anniversary band Alex had given her the night Hannah was conceived—winked menacingly in the soft light. He hadn’t said a word since pulling them from his pocket. USA Today bestselling author, Nina Pierce, resides in New England with her high school sweetheart and soul mate of twenty-nine years and several spoiled cats who consider her staff. She spends her days at the keyboard writing romance stories, blissfully creating chaos for her characters by throwing in a villain or two, a little murder and a whole lot of mayhem as they struggle toward their happy-ever-afters. You can check out all her books on her website (http://www.ninapierce.com) and follow her day-to-day happenings on facebook (http://www.facebook.com/author.nina.pierce) or twitter (http://www.twitter.com/ninapierce). The main reason why I don't finish a book is if it is boring and sometimes if it is too predictable. Good morning Janet. I totally agree! When I read a mystery or thriller I definitely want to be kept guessing until the last possible moment. Thanks so much for stopping by and commenting. I'm pretty forgiving with books. I figure if I spent money on buying it, I'm going to finish it. I may not be head over heels in love with it but I've always enjoyed the process of reading and seeing the story. Things that make me want to give up...horrible spelling, grammar errors. I know that mistakes happen but when they are on every page and glaringly obvious...That's hard. Throughout all of my reading, there has been one book that I did not finish because it was too graphic with details of a murder... the details were extreme and actually made me sick to my stomach... I put it down and never picked it up again. I have never had that happen before... I enjoy a character's journey through the pages of a book... to see them deal with the bad things that happen, triumph over evil to get to a HEA. Just one other book took me 2 years to finish... it was so boring with descriptions of everything, I had to keep moving on to other books. I want a book that will grab my attention and keep it... make me want to keep turning the pages to see what will happen next and how their HEA comes about. I don't read the horror genre for the same reason, Colleen. I don't like to be scared or grossed out! Thanks for sharing. I think as long as the writing is good, I'd be compelled to finish no matter what the hero/heroine is like. But as far as liking the main character I am not very open-minded if they have serious flaws or are a criminal of some kind. I think of the tv series "Chicago Fire". The villain in that series actually redeemed himself and is now the police hero of "Chicago PD". I do enjoy a good villain who's motivation makes sense and is redeemable in the end. But the change has to be believable. Thanks so much for stopping by and sharing, Shannon. BN - I've heard a lot of readers talking about this new trend for writers to leave a book on a cliffhanger (though I haven't tried this myself). Some readers really enjoy it and others refuse to read that type of book. I'll usually give a bit of leeway before abandoning a book. I definitely can't finish a book with an abusive hero or heroine. Jane - Abuse by the hero or heroine would definitely not be something I would enjoy in a story either (reading or writing), I have to agree with you there. But I have read and written books where the abuse is perceived which added a nice twist to the story. Congrats Nina on the new release! I'd have to say as long as the story draws me in and I get engrossed in the characters, I can forgive a lot. Like someone else said, I can't forgive wooden cliches and characters. Thanks for sharing! So glad you enjoyed the excerpt, Erin! I like different. I want to be surprised. Predictable is just boring. I'm not into anything horrifically gross - so no flesh eating heroines thank you. LOL! Yeah, I haven't tried any of the zombie romance, Mary because I just don't think I can find a brain-eating man as the hero-type. Thanks so much for stopping by and taking time to comment. Thank you everyone who stopped by and commented. CONGRATULATIONS TO JANE ... your name was chosen at random (using random name generator) as the winner of the $10 Amazon gift card. It's winging it's way to you.